I have frequent encounters with stress in some or the other form. And if it’s correct to call it a “Necessary evil”, this one tops my list of evils. Though I find stress completely un-necessary, it doesn’t stop coming. I have known Stress since my school days, but our relationship was limited to occasional meetings then, especially during exam days. We became good buddies a few years ago when I took my first job. Since then we have been meeting on various official and personal occasions. No, please don’t think that I suffer from any stress-phobia (not sure if there is a clinical term for it), I just dislike it for the way it makes me behave. With my heart beats accelerated to 200 times per second (under stress), I find it difficult to concentrate and often fail to multitask. Otherwise well appreciated for my people skills, when at stress I become irritable and impatient. I always keep to deadlines, but stress impacts my performance. Any job that I accomplish under pressure is not as effective as it is otherwise. Practice politeness – I know it’s hard to be calm and polite when even the slightest discomfort seems provoking but this trick works for me. Stress impacts your quality of interaction. When stressed out, I cautiously put that extra politeness in my words while taking to anyone. Gradually the agitation vanishes. Tea/Snack Break – When stress hits me at work, I steal a few minutes to go for a tea break. Chatting with colleagues and friends helps to soothe my tense nerves. Back at work, I feel much relaxed and energized. Play time – If am not good with gadgets and online games but when things seem tough, I enjoy social gaming. Icy Tower and Parking Wars are my saviors …find out yours. Assertiveness – I am not a people pleaser but at times I find hard to say “NO” and often end up over-committing myself. I learned this during a “Self-Management” workshop that “when you allow yourself more than enough time, you reduce the stress and pressure on yourself”. I am still on my journey of practicing assertiveness but I have learned to set my priorities and work accordingly. There are varieties of things you can do to reduce overall stress level, just find out the tricks that work for you. Stress comes in different quantities and qualities. Quantities of stress can roughly be categorized as low, medium, and high. Qualities of stress can either be hindrance stress or challenge stress. Generally, people perform better under challenge stress (a difficult, but achievable goal) versus hindrance stress (things keep popping up that keep you from obtaining your goal). Sometimes — and this part is important — the difference between whether its a hindrance stress or a challenge stress is the way we perceive it! Thanks for stopping by Dr. Philip and sharing wonderful insight. 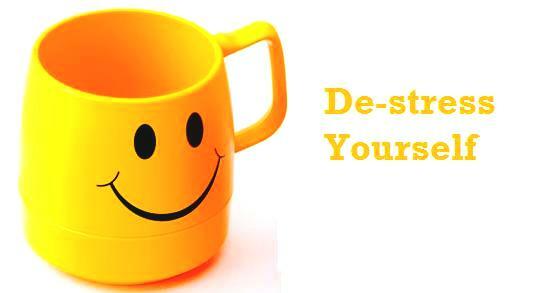 Glad you liked the post…I completely agree to your thought that stress as challenge, proves positive for productivity.